SERVING ALL OF CENTRAL FLORIDA! Your search is over! 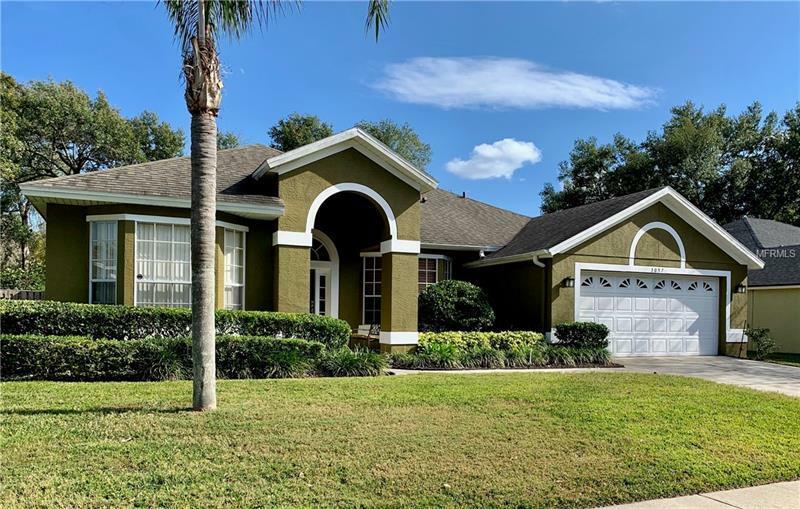 Don't miss your opportunity to own this beautiful home located in the desirable Beechwoods subdivision in Seminole County. This home has been meticulously maintained and features a spacious single-story floor plan which includes separate living, dining and family rooms. The homes spacious eat-in-kitchen overlooks the sparkling screened in solar heated pool and private fully fenced yard. There are two master suites! The first suite features walk in his and hers closets, dual sinks, garden tub and large standing shower. The second master suite also includes a private bath and would be perfect for a home office, mother-in-law suite or bonus game room. Some of the many upgrades/features of the home include: Volume and vaulted ceilings throughout, Upgraded diagonal tile flooring throughout living area, Large covered and screened paver patio and pool surround, NEW ROOF 2013, Pebble Tec pool surface 2010, NEW AC '10 and Gas spa heater '18. Beechwoods is a small well maintained neighborhood with well lit sidewalks and friendly HOA and zoned for TOP RATED Seminole county schools! (Bear Lake Elementary School, Teague Middle School, and Lake Brantley High School!) Conveniently located near shopping, dining, entertainment, schools, and major highways. Call today for a private showing! Pet Restrictions: Buyer to verify directly with HOA. Savings based on comparison to paying a 6% commission. Commissions may be negotiable and are not established by law. The information herein is deemed to be accurate, but not guaranteed. All information to be verified. Savings based on national statistics since 01/01/00 for all Assist-2-Sell offices in North America compared to paying a 6% commission. Copyright © 2019 Mid Florida MLS. All rights reserved. The data relating to real estate for sale on this web site comes in part from the Internet Data Exchange Program of Mid Florida MLS. Information provided is for consumer's personal, non-commercial use and may not be used for any purpose other than to identify prospective properties consumers may be interested in purchasing. Assist2Sell Foutz Realty Team participates in the MFRMLS Internet Data Exchange (IDX) program, allowing display of other MFRMLS broker's listings on this site. However may not include all listings currently available. Information is deemed reliable but not guaranteed. Information last updated at 2019-04-22 18:45:50.